This summer has been all about the weather. Thunderstorms day after day. Rain in between thunderstorms. If I had the interest, I could watch mold form on bread in real time. Wet doesn’t begin to describe our micro climate. 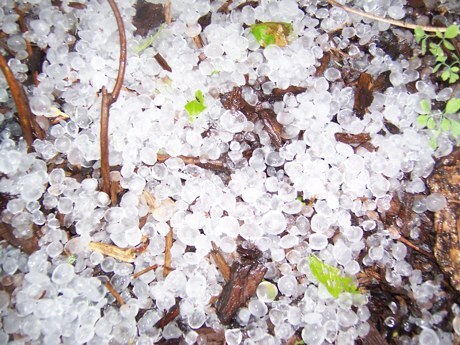 We have also had hail. Lots of it. 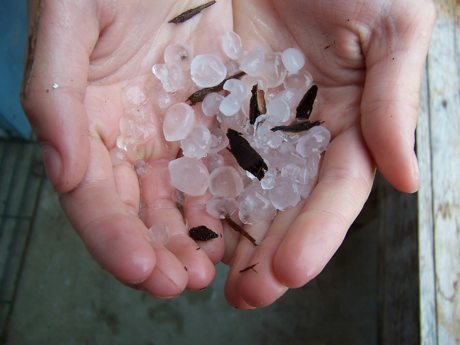 Hail saves time in the kitchen as it makes for pre-shredded salads. During a particular hail storm last weekend, the farm was also struck by lightning. For some reason, I happened to be looking when the bolt hit at the top of the drive. Whoa! It took out our power and also destroyed our internet router. This storm also brought a microburst to the other side of our town. Big groups of old trees were lost. This left the power company in over their heads with problems. It took awhile for us to get power back. It also took us several days to get a new router up and going. Staffers scattered all over town to pick up email from other people’s computers. When the sun finally came out on Friday, it felt as euphoric as sunshine after six months of arctic winter. We were positively giddy! Finally a chance to make Teasel Flower Essence! 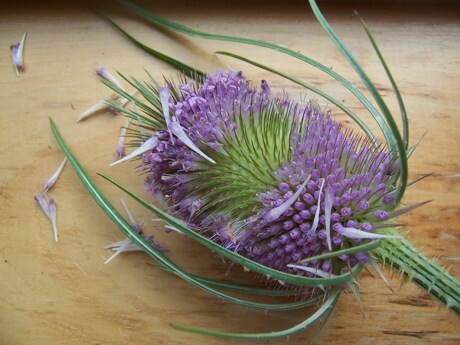 Somewhat reminiscent of the marvelous cleanser Bee Balm, each Teasel blossom resembles a sliver and recedes deeply into the Flower head, Each Flower head has bands of Flowers in different places. Some Flower heads have two bands top and bottom, some a more central band like this one in the photograph. I was guided to use a great diversity of Flower heads with different band placements when I made this Essence. I know this band difference holds much significance for this Flower Essence, referencing as it does the different chakras. Here is what I mean about the blossoms extending like slivers into the spiky core of this Flower head. And spiky is an understatement for Teasel. It’s almost impossible to touch this plant without getting pricked! Right off the bat, this Essence is going to be added to our Flee Free and Golden Armor mixes, but I doubt it will stop there. This one is an immense powerhouse of wisdom and strength! 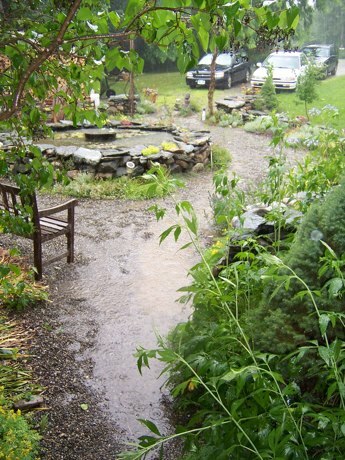 Well… it is raining again. These gray days certainly make it easier to find the time to do my hand exercises. I have been upgraded by my hand therapist to a new splint torture device dubbed “the Claw.” It bends my wrist in a contorted position and looks as uncomfortable as it feels. This new tool was necessary because, despite my diligent hours doing all my exercises, the severity of the break is leaving it difficult to regain the function of my wrist. The motion of flexing is proving particularly hard to regain. My hand therapist is hopeful that “the Claw” will help me slowly regain more degrees of flexing movement. When I am not doing specific stretching and bending exercises for extension, flexing, supination and the rest, I am meant to wear “the Claw.” This is further motivation to do the other exercises since they offer a variety of torture sensations while “the Claw” holds me in the same torture position. each night. It has been my sports shining hour. I am the household guru of cycling. And it only took a hundred plus hours of Tour watching to earn this crown. Too bad the Tour finishes today with Carlos Sastre of the fabulous CSC pulling off a somewhat unexpected yellow jersey win over Silence Lotto’s Cadel Evans. Oh my gosh. My list of hand exercises gets longer and more complex every time I see my dear hand therapist Cindy. What’s a woman on a healing mission with a new Tour addiction to do???? Thank God the Olympics are just days away. My man Mark Cavendish of Team Columbia is expected to bring home the gold in the sprint races in Beijing and I will be there. Me and my Claw. 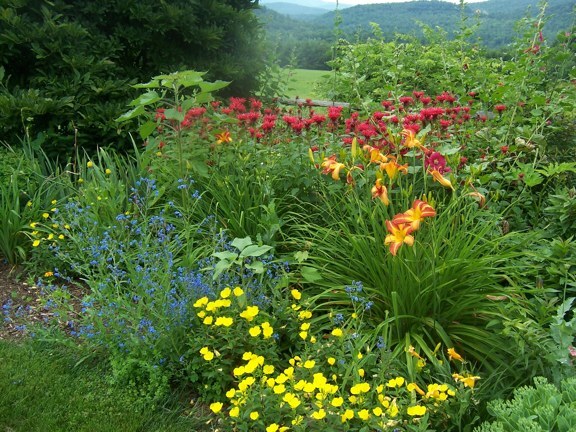 The Flower gardens have fared better this summer than the vegetable gardens. With the vegetable garden so low key this summer and me relearning my kitchen knife skills, there isn’t too much post harvest production going on right now. Mostly, I ponder how to reconfigure the main vegetable garden next year to make it more manageable for myself. 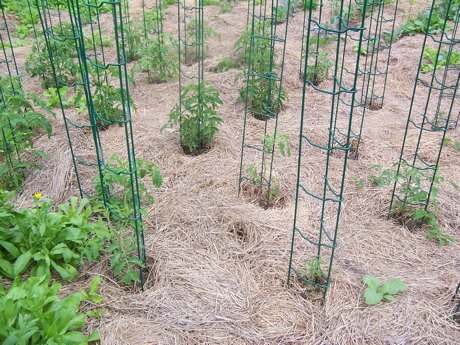 Not surprisingly, when you put the tomatoes in a month late, they look oddly stunted for mid July. Here they are, the teeny tiny tomato plants…….I am glad that the Flowers don’t seem to mind the benign neglect of this summer as much as the vegetables. 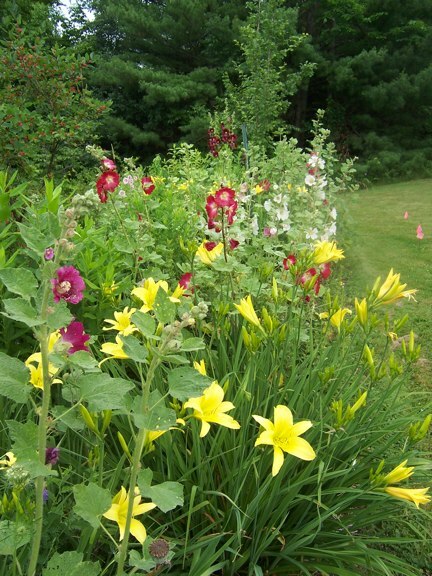 Here are two very traditional New England garden friends, Lemon Lilies and Hollyhocks, sailing along in a flower bed that has only been half weeded once this summer. In this shot, another Nature Spirit can be seen over the bee balm. For some reason, that is what they look like on film, a ball of slightly opaque air. 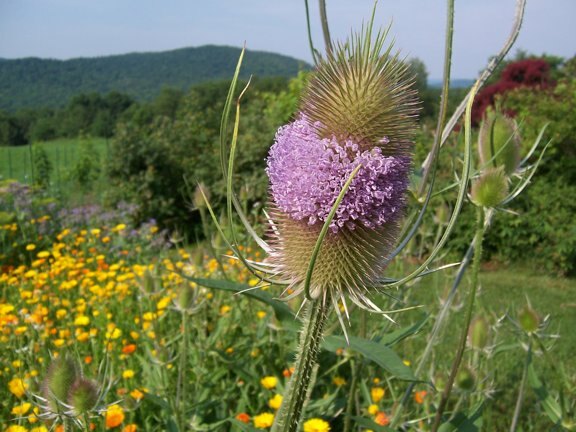 Here is a new Flower for Green Hope Farm, Teasel. I am very excited that it is beginning to blossom. As a biennial, it only blooms after two years, so I started growing it last year to make into a Flower Essence this summer. Teasel is not found around here, so this is the first time I have met this plant. 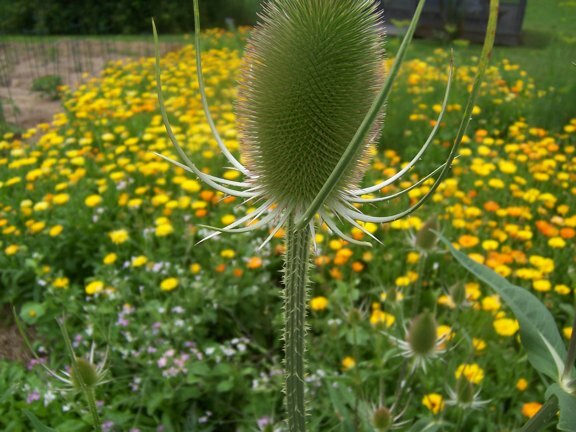 I decided to grow Teasel after seeing it in a garden book listed as a weed. With the intense geometry of its incredible prickles, I knew it would be an excellent addition to Flee Free. When I transplanted it into the garden, I noticed that the deer just could not leave this plant alone. I had to build a nest of sticks around it during the spring to save it from the deer devouring every last leaf. This made me think it might be an excellent remedy for Lyme disease. Since planting this plant, I have heard that David Dalton, another Flower Essence maker, already uses it to address Lyme disease. I find this very heartening and know that within a few short days, we too will have Teasel Flower Essence to offer in support of people and animals dealing with this disease. I feel certain this is a Flower with an Essence of profound depths. I will try and get more photos to reflect its strengths and will let you know as soon as this one is made. I am waiting a few more days to see how the Flower heads evolve and to get the green light from the Angels that it is time to make this Essence. As I noted, this is not a plant I have met before and I am so grateful that it is now flourishing here. Its not just the Flowers flourishing. 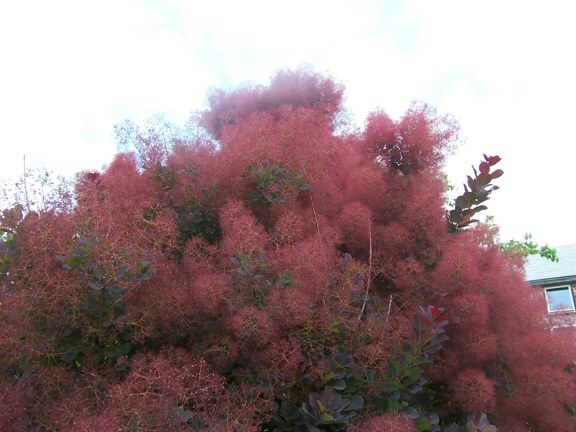 Here is the Smokebush doing its smoky thing. As always, it really sets off the Echinacea. 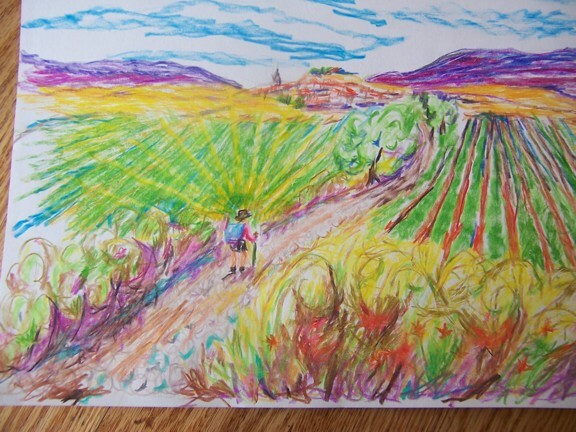 In the first weeks post arm fracture, I was sufficiently out of it to sit in the kitchen while others cooked and only once in awhile cry out, ” Is something burning?” Most of the time the place could have been on fire and I would not have noticed. Then, there was the second stage of my recuperation in which I was more alert, but still unable to do anything but offer what I thought of as helpful hints. According to everyone else, this meant I sat at the kitchen counter watching the meal preps while giving, and I quote, “way too much advice”. The various Iron Chefs filling in for me during my early recuperation did not appreciate my brilliant insights into their culinary activities. At all. They called it back seat cooking. What can I say? During the last two months I have not pined to scrub a toilet or do dishes, but having no role in the kitchen has been a challenge. I was numero uno Iron Chef here at Green Hope Farm kitchen stadium for almost thirty years. And then suddenly, I was part of the studio audience. Not understanding my role as silent observer, I chimed in a lot. Had I been in Iron Chef Masaharu Morimoto’s kitchen stadium, I would have been ejected. I tried to be responsive to this feedback. I tried to zip it. It was clearly the only way to family harmony and a full stomach. This is when the stakes went up and my learning lessons about letting go of my little kingdom accelerated. Because the kitchen was no longer my stage set, my Iron Chef challengers made some changes. One heartbreaking change involved my lovingly over stuffed utensil drawer. It had been driving Jim crazy for almost the full thirty years of my Iron Chefdom. He likes a drawer he can open. I like a drawer that has every conceivable gadget in it. Now that I was working to stifle my input, Jim took this window of opportunity to organize the utensil drawer to meet his needs as current head Iron Chef. This meant removing 85% of the tools I feel are vital to any meal prep. Things like melon ballers and zesters. I watched him clear the drawer and then stuck my oddly numb fingers, gloved and splinted, into my mouth to silence my Edvard Munch-like screams. This silent screaming grated on the kitchen crew and so Iron Chef Jim, Will, and Ben came up with a solution. During meal prep, I was escorted to a place far, far away from the kitchen to a seat in front of the television. Then they sedated me with food network television. HD no less. This proved to be a win win situation for everyone. My vow of food prep silence became a piece of cake. On television, no one every lets anything burn. And if I broke my vow of silence and gave Giada suggestions, she didn’t care. Back in the Green Hope kitchen stadium, Iron Chef Jim and company could cook in peace with their appallingly limited number of kitchen utensils. In one of those frequent moments in which I miss the real plot while clinging to some red herring subplot, I began to think deepening my acquaintance with Nigella Lawson and Bobby Flay was going to have dire consequences for the new Green Hope Farm Iron Chefs. One of my arms might be in a sorry state, but that didn’t mean I couldn’t print out myriad recipes from food network.com to give them some direction in their efforts. The real story was that they were hitting culinary peaks without ANY input from me, whether verbal or otherwise. By osmosis, the flavor high notes of the food network were their high notes. One night after an hour sedation in front of Paula and Ina, I was dragged back into the kitchen to discover Iron Chef Will had rubbed down a pork shoulder with Tyler Florence’s favorite pork rub, marinated it overnight and then cooked it for four hours. For dinner, I was offered Will’s take on a classic pulled pork sandwich. I don’t think I had heard of pulled pork until I was fifty. Will is thirteen. On another occasion, while my skin crawled watching Semi Homemade with Sandra Lee, Iron Chef Ben arrived from his off site studio kitchen to work on his salmon gravalax while offering us pancetta, shrimp, and sirloin kebobs with a side of lemon linguine. And this was just the first meal Iron Chef Ben whipped on us. Every few nights he arrives with a carload of exotic dishes. I can’t spell anything he serves, but who cares? It is all delicious. So now stage three begins. My hand is a lot better. I do about four hours of rehab on it each day, work to get it to supinate, flex, and swivel. And degree by degree, this miraculous joint is on the move again. While I can’t actually unscrew a lid or use a can opener, my kitchen skills are returning. I can butter toast, sort of…. But do I want these new Iron Chefs to know that? How long can I keep this gig going with me watching television while they slave away in a hot summer kitchen making fantasy meals for me? As I slump down in front of Jamie Oliver for his take on broad beans, I consider my chances. The only thing worrying me is that I have begun to return my favorite utensils to their home. This could definitely give me away. william and his friends, jeff and jack from taylor farm, have spent this week building a float for the town’s fourth of july parade. the theme of their float is farming in the fifties. they will ride their decorated wagon, pulled by a vintage tractor. there seems to have been somewhat of a tussle about who would drive the tractor. they were hoping it was legal to have one of them at the wheel. not surprisingly, thirteen year olds still can’t drive a vehicle even in a parade, so jeff and jack’s father, bill, will be driving today. will is just about to leave to go to the parade assembly point. he is quite cross about his fifties outfit because it includes a v neck white t-shirt. apparently this is the absolute worst fashion statement to make if you are a thirteen year old boy. and I can’t convince him everyone will know it is a costume. it’s funny how there is almost always a rub to our assignments, even when we choose them consciously. it’s so easy for me to see beyond the v neck to imagine just enjoying being in the parade, just as it would be so easy for another soul to see beyond the angel’s firm order to me to do no weeding or deadheading this summer while my arm heals. many could relish this mandatory time out more naturally than me. i may not notice cobwebs, but i seem to notice every weed. 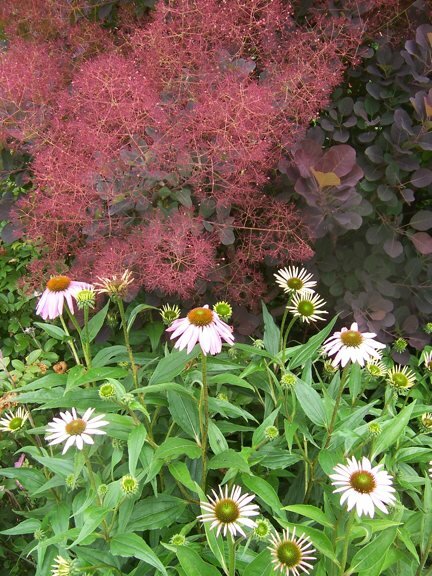 walking by the garden planter’s that so urgently need grooming and strolling through the many beds of flowers that now have grape, mustard and lamb’s quarters as their serious bedfellows can sometimes drive me a bit nuts. sometimes i don’t care so much and really do just appreciate all that is well. but not always. in my own way, i too don’t want to wear a v neck t-shirt. my fingers, even the splinted ones, itch to do just a little bit of deadheading here and there. life so often grooms us like someone stroking the fur of a dog backwards. events call us to go against our grain. while i have no sense of how things are going with my own surrender to all these uncomfortable divinely inspired changes in assignment, i feel in awe of how others around me have risen to the occasion. deb has run the office this spring. she has not only kept things running incredibly smoothly, but she has come up with some wonderful innovations in our systems. emily would never have chosen to do the bottling, yet she has done it with so much love and care. 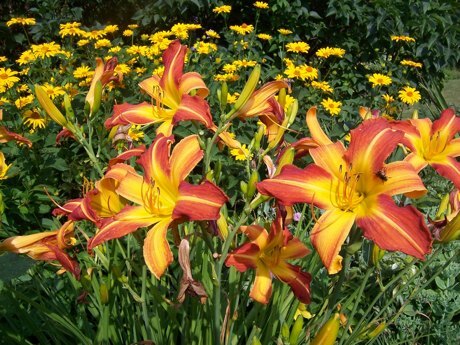 the process has deepened her own inner experience of her divinity and the flowers. i get to hear what she is learning from the flowers. spiritual doors are opening for her that surprise and awe us both. for me to be called away from this job and have it fall to her has been a better gift than anything i could have consciously given her. and it is an equal gift to me to see her blossoming in this new way. ben, will, and jim have lit up the kitchen with their efforts- so much so that i have a separate blog to share on that topic. i bow to their superior domestic skills and to their good cheer in dealing with my kibitzing. and then there is elizabeth. she arrived in santiago de compostela today after walking 500 miles across northern spain. to be asked by her heart’s divinity to make this pilgrimage and then to have to do it against the grain by starting her journey alone, that took courage. that she ends this pilgrimage surrounded by kindred spirits from all over the world, that is grace.